One of our customers took the initiative with one of our postmark cancellation type rubber stamps, and creatively combined things into a very innovative design. So innovative that we've decided to make it one of our custom rubber stamps available to everyone. The best of everything all in one rubber stamp! It serves not only as a copyright stamp for photographs or other works of art. But also as a return address stamp and a postal type cancellation for the stamp artist, mail artist, and those of us who like the unusual to accent our mailings. Your Copyright Rubber Stamp will be customized with your name in the top of the circle along with the Copyright symbol and year to meet U.S. Copyright law requirements. (The current year will be inserted along with your name unless otherwise specified.) Your return address will adorn the center of the rubber stamp and just about anything you wish can be added to the bottom of the circle (space is limited to 15 characters - applies to both top and bottom text areas of circle arcs). Unless specified otherwise, the bottom arc of this design will include the word "photography" as shown. Please Note: Space is limited within the inner circle area. Please limit your text entries - too many characters per line requires us to reduce the size of the font used to fit the space available. This can cause difficulty reading small text. 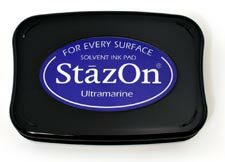 Use any color ink with this handstamp - requires separate ink pad not included. Rubber stamp image measures 1 3/16" OD. Rubber die is closely cropped for smudge free impressions and mounted on standard round mount with handle and thick foam cushion. Order these for use as a return address stamp, to `officially` frank your artistamps, or for scrapbooking projects. You cannot have too many of these fun rubber stamps when it comes right down to it!